If you’ve flipped on the news recently, you’ve probably seen the weather man pointing at a picture of the latest tropical storm heading this way. Indeed, hurricane season is here again. And with the after effects of Hurricane Katrina still resonating, more and more people are looking for ways to protect themselves and their families in times of danger. When it comes to protection from natural disasters, bomb threats, radiation concerns or household intruders, safe rooms or bunkers are one of the best ways to stay safe. If you’re considering including a shelter in your home, it’s important to be educated about the kinds of structures you can build, what materials need to be used and where they need to be placed. There are a number of different kinds of facilities that can be built in or around your home, ranging from above ground storm rooms and walk-in vaults to underground storm cellars and panic rooms. So which one should you choose? It all depends on what you intend to use the room for. Each room serves a different purpose, but all are adept at keeping you safe. 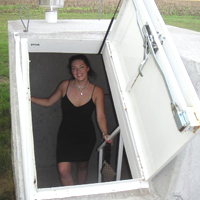 Underground structures like lean-tos, storm cellars and bomb shelters are typically used for protection from high-wind storms like tornadoes and hurricanes as well as possible nuclear attacks. Panic rooms and walk-in vaults are generally found in the upper levels of a house and function as a hideout for families if a burglar were to enter. They can also be used to store important documents or valuables while families are out of town. Storm rooms and slab-on-grade structures are generally found on the first level of a house and serve as protection from hurricanes and other wind storms. Fallout shelters, though not as common anymore, were popular during the Cold War when people were concerned about nuclear explosions and radiation. These structures are still around today, but they mostly serve the same purpose as storm cellars. How Are Bomb Shelters Constructed? When considering building a bunker or bomb shelter or safe room, it’s important to remember that the materials need to be a lot stronger than those used to construct your house. Most houses are built in accordance with local building codes, which require that a building be able to withstand a “design” wind event that may occur in a given area. For example, houses built on the Gulf Coast are built to withstand the high winds of a hurricane since those are common in that region, while houses built in the Pacific Northwest are built to withstand much lower wind speeds due to the less intense weather. Just because a house is built to code does not mean it will be safe when a storm hits, which means a safe room must have higher building regulations if it is going to stay in tack. Usually, safety structures are constructed from concrete or concrete masonry, but only if it is being placed underground or in the basement. These structures have to be properly anchored to the house foundation, and connections between all parts of the shelter must be strong enough to resist failure, meaning walls, roofs and doors must resist penetration by windborne objects. A lean-to can use current basement walls, but they must be reinforced, and it has to have its own reinforced ceiling to protect from falling debris. A slab-on-grade can be built as an addition to a house, but the walls have to be completely separate from the house. These structures work best for houses that do not have a basement. For a house that has a crawl space, it is difficult to build a shelter since the entire structure including the floor must be separate from the framing of the house. A shelter designed for protection from a hurricane should not be built in an area expected to flood, so its important to know if your house is in a storm surge location. Concrete cannot be used for a panic room on the second floor, since the house’s structure cannot compensate for the extra weight. Many panic and safe rooms are made with steel and Kevlar—high strength fiber that’s five times stronger than steel. If you are building a freestanding storm room, it’s best to use an interior room like a bathroom or closet as the base for the structure. These inner rooms offer the advantage of having one door and no windows, making it easier to transform them into shelters. Storm cellars are a pre-constructed room that is placed into the ground either under a house or next to it. These are popular for people living in tornado-prone areas of the country. It is important to note that it is much easier to build a bunker into a house as it is being constructed, but older houses can have safe rooms put in. It takes more time and may require a lot of disruption to the house, but it can be done successfully. What is the Best Emergency Structure for You? When considering building a bunker or safe room, you need to think about the level of safety you want, the kind of things you need to be protected from, the available space you have and how much it will cost. As mentioned before, basement lean-tos, slab-on-grades, freestanding storm rooms and storm cellars function well in high wind storms, so these are great for people living in areas with extreme weather. Since tornadoes are usually quick storms, shelters do not have to be too spacious or comfortable. It is recommended that there be five square feet for each person who will be using the shelter. Hurricanes can last for hours, so you and your family should have at least 10 square feet per person, so you can move around with ease. As far as cost and convenience go, basement lean-tos are the easiest to construct. The materials are relatively inexpensive and you don’t need a lot of concrete, especially if you use existing walls for part of the structure. Storm cellars do not require any extra construction on your house, but you do need enough available underground space, for instance in a backyard or under your home’s foundation. Panic rooms, walk-in vaults and storm rooms must be built above ground, meaning you need to have a room with enough space to add a shelter or a current closet that can be turned into one. The materials for these shelters are a little more expensive, and the cost will go up with any extra amenities you want to add, like security cameras and phones for the panic room. Building a bunker or storm shelter in your home is a big decision, so you need to consider all the factors. First you need to determine if you live in a high risk area. Local weather services provide maps of all the areas in the country where natural disasters occur the most. Second you need to figure out the level of safety you want, since each shelter offers different benefits. Third, you should pick out the best place for your shelter and make sure you have enough room in or around your house. Lastly, you need to factor in the cost of the structure as well as the time it will take to construct. No matter what kind of shelter you want to build, the best thing to do is set up a meeting with a skilled contractor who can assess your home. A building contractor can suggest locations for the shelter, take measurements, analyze your home’s foundation and construction and provide you with a rough estimate on time and money. Contractors are also familiar with shelter regulations, so you can be sure your structure is properly constructed. If you want to know more about personal bunkers or shelters, or if you want to set up a free consultation with a contractor in your area, contact our offices today.